Before the digital age, recording music and audio clips were a lot more difficult and expensive, not to mention, also time-consuming and requires more gadgets to get a pristine output. However, thanks to the innovation of technology, it has never been easier today. Today, with a set of studio monitors, a mic, and a laptop, you can start recording your guitar riffs, vocal solos, groovy bass, or just anything you want to record! These speakers would not just playback your recorded music; it can play your music with astounding details! Those details even include all the flaws in your recording—all the unnecessary noise, errors, and everything that is not intended and not pleasing! Whoa. The details can be so superb that you can hear all the major and minor flaws to help you achieve perfection! How cool is that? While doing your recording, studio monitors may seem insignificant as they take a backseat. However, when you are about to listen and check your recording’s output, that’s when studio monitors play the lead role. Studio monitors allow you to hear the highlights of your recording. These also help you identify the not-so-good parts—those that need to be taken out or re-done if there’s any. Hence, that practically explains why many are eager to have the best studio monitors there are. First and foremost, you must define how much you are willing to spend for studio monitors. There are a lot of good brands on the market that vary in durability and cost. Again, expensive doesn’t always mean it’s the best! A crossover is an electronic tool that catches a single-input signal and divides it into two or three output signals composed of separated bands of low-, mid-, and high-range frequencies. These different bands of frequencies feed the different speakers in a sound system—tweeters, woofers, and subwoofers, which are fitted into studio monitors. A bi-amp or a tri-amp monitor has a crossover placed before the amplifiers, and each speaker is powered individually. Although a regular speaker can deliver divided frequencies to the correct channel, a multi-amped studio monitor would give more clarity of sound. Since different bands of frequencies are sent to individually powered speakers through a crossover, you will have better control over your equalizer and will give you a clearer sound. You will find it easier to cut specfic frequencies and listen to each section of the frequency range. A key element in making the most out of your studio monitor is proper positioning. Thus, the space you have in your studio should be sufficient to allow this and help your studio monitor perform at its best. By placing your speakers in an optimal position, you will have a better perception of the sound you have recorded. Furthermore, you will get the best projection of sound by forming an equilateral triangle with the speakers and your head. The speakers must be at least three feet away from you to simulate correctly how your recording would sound. Now that we have established how cool studio monitors can be, here’s a review of one of the best on the market today. In 1946, James Bullough Lansing founded JBL, a company that started out with two distinct product lines that deliver professional audio electronics and consumer electronics. Today, JBL is one of the most trusted brands of loudspeakers and other audio electronics. This monitor is equipped with a five-inch low-frequency speaker and a one-inch dome high-frequency speaker. These speakers are individually amplified with 41 watts of power. It also has a balanced XLR input that measures 1/4 inch. JBL LSR305 Professional Studio Monitor is a pair of active speakers that need to be plugged separately into a power source. However, this speaker can be used individually but works best when used as a pair to cover left and right channels. This product is fitted with JBL’s patented Image Control Waveguide technology that adjusts to your position as you move around the studio. This product is fairly priced for the features it has. The five-inch speaker and the one-inch tweeter are individually amplified for better frequency control. A globally known brand manufactures this studio monitor. 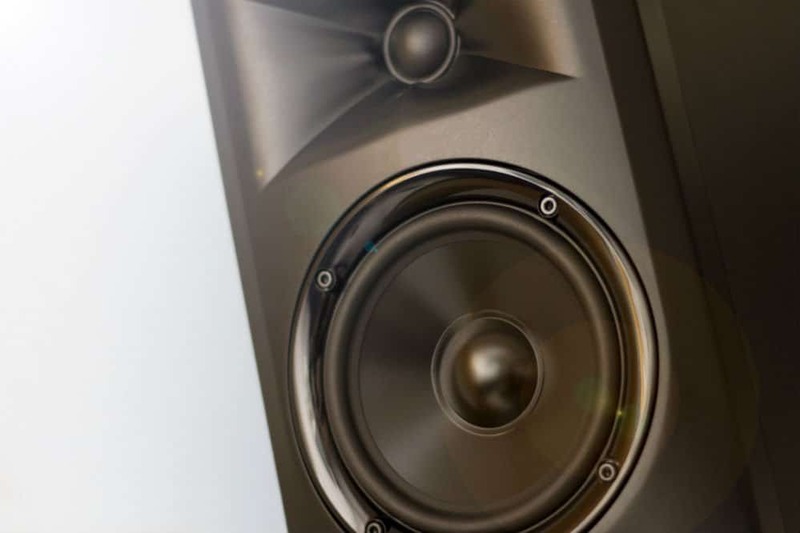 Studio monitors are intended to help you end up with high-quality and pristine recording. JBL’s LSR305 is an affordable device that has features of high-end professional studio monitors. The manufacturer has decided to equip their affordable range monitors with high-end new tech, Image Control Waveguide, to give users the ability to listen to their recordings without exiting the sweet spot. This featured technology adjusts to your position accordingly to make sure that you would be able to review your recording accurately even while you are moving around your working table. Also, it is bi-amplified and gives you better control over your high and low frequencies. Mackie, another manufacturer of studio monitors and other audio equipment, has a bi-amplified studio monitor model; the Mackie MR524 Powered Studio Monitor. It has a 65-watt bi-amplifier for the five-inch speaker and the one-inch silk-domed tweeter. It is equipped with a technology that covers a large area of the sweet spot for listening pleasure. Although it costs much cheaper than JBL’s LSR305, the sound quality it projects is not comparable to the latter. The JBL’s Image Control Waveguide technology gives a better and more accurate sound projection. If you want a studio monitor that can serve you well without having to rob the bank, then JBL LSR305 Professional Studio Monitor is your best bet for is a miniaturized version of their high-end professional-grade studio monitors. This set of speakers is bi-amplified and has clear sound projection. With its advanced and state-of-the-art features, you will come up with high-quality recordings that would take your audience in awe!